After The Floods, Colorado Hospital Braces For Winter : Shots - Health News A hospital in Estes Park, Colo., escaped the flood damage that affected much of the area this month. But the small hospital in the mountains now relies on a single road to evacuate critical patients. A bad snowstorm could stop traffic and ground helicopters, leaving the hospital isolated. As snow begins falling in Colorado's Rocky Mountain National Park, the town at its doorstep, finds itself newly isolated. The only year-round road into or out of Estes Park, Colo., now is the Peak to Peak Highway. It traverses a jumble of mountains all the way. It's not the kind of road an ambulance can scream over at 60 miles an hour. "Not while I'm in the back, hopefully," jokes paramedic Erle Collum. The recent flooding in Colorado washed out the other two roads into town for miles at a stretch. 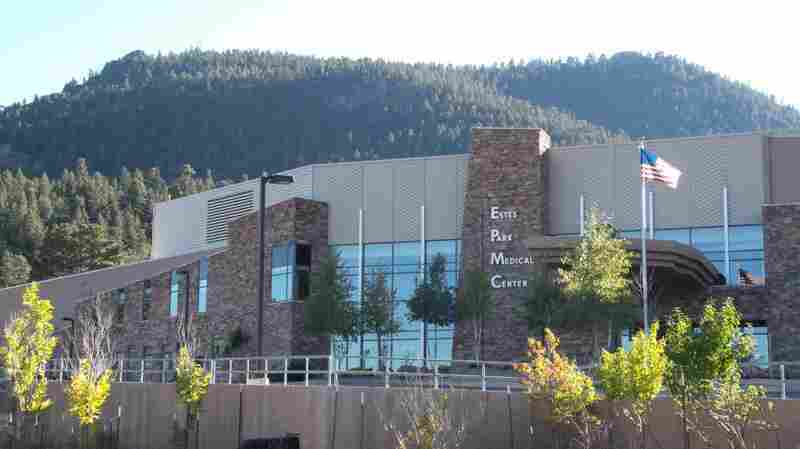 That's bad news for Estes Park Medical Center, the town's only hospital. Help from big city medical facilities that used to be an hour away is now more like three or four, via this single remaining road connecting the town to the rest of the world. Collom says he's grateful the town's ambulances have four-wheel drive. "In the winter time we can get some pretty good snow around here, so it's a nice thing to have, just because of the area we work in," he says. It's typical that there's snow on the ground from late September through April. Estes Park is a town of about 12,000, and it sees 3 million national park visitors a year. But the town's 25-bed hospital isn't set up to take care of critical cases for very long. Collom says at least one patient a day gets sent down the mountain to an urban hospital for more advanced care. And not everyone stable enough for the old hour-long ambulance ride will be able to take one stretching four hours or more. "They're not the best roads anyway, so I suspect it'll complicate things when winter finally comes around," he says. The hospital already makes pretty frequent use of helicopters for the trip to larger hospitals. There's no place for airplanes to land, and mountain weather keeps helicopters grounded about half the time in winter, says Bill Collins, a paramedic who flies helicopter missions into Estes Park. "You're basically kind of like being in the center courtyard of a castle, and the castle walls are the mountains," he says. Before, the hospital could usually count on either an ambulance or a helicopter as the failsafe. Now, a blizzard that makes air travel dangerous and closes the remaining road could cut off the town. So Dr. Martin Koschnitzke, the hospital's medical director, worries about possible life and death situations, like a premature birth. Premature babies need an intensive care unit, and there is none in Estes Park. That means doctors have to pump air by hand into the preemie's lungs until it can get to an ICU with a special ventilator. "I don't know how long our pediatricians could manage that baby here, I've seen them do it for multiple hours, I'd never want to see them do that for multiple days," he says. And, he says there's nothing worse than not being able to get a patient to needed care. With an uncertain winter coming, Estes Park hospital CEO Bobbi Swenson has to figure out a budget. She expects increased costs, and is unsure whether they'll all get covered. Will insurers pay for a lot more helicopter and ambulance rides? And then there's staffing. Half the hospital's workforce lives down the mountain. Swenson's offering temporary housing. But, she says, "There are some people that are not going to be willing to come up here for three to four days and be away from their families." It's unclear when daily commuting will be feasible again. And the hospital may even be busier, serving townspeople who used to drive down the mountain for everything from orthopedic surgery and chemotherapy to basic primary care. Many small, rural hospitals like Estes Park's get special critical access payments from the federal government. But President Obama says he wants to trim those payments by one percent. Swenson says full funding is essential to keep facilities like hers open. All the uncertainty at the top for now doesn't change things at ambulance-level in Estes Park. Erle Collom closes his up and gets ready for the next call. "We're hanging in there and we'll get through this flood stuff, and we're still taking care of people," he says. "That's what we do. A little more challenging to get through, but we can do it." Engineers say they may restore more access to Estes Park by December, but that may be only a one lane gravel road in many places. State and federal governments have pledged $120 million to fix Colorado's roads. State officials say repairs may actually cost more than half a billion. This piece is part of a collaboration between NPR and Kaiser Health News.